Giraffe numbers have plummeted over the past three decades. Earth's tallest land mammal, the giraffe, is now threatened with extinction, according to an update to an international list of threatened species. Over the last 30 years, giraffe numbers have dropped by 40 percent across the globe, from around 151,702 to 163,452 individuals in 1985 to 97,562 giraffes in 2015, said officials who updated the threatened species list for the International Union for Conservation of Nature (IUCN). 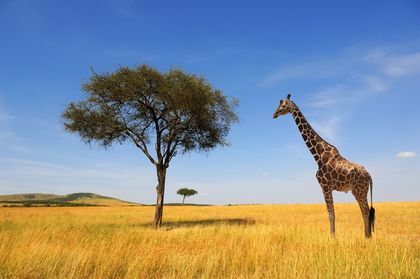 Giraffes (Giraffa camelopardalis) live in southern and eastern Africa, with small, isolated pockets of giraffes also calling west and central Africa home. Before the reassessment, giraffes were considered a species of "least concern" on the IUCN Red List, a notation indicating the group is widespread and abundant. However, "habitat loss, civil unrest and illegal hunting" have decimated the population, the IUCN said. Of the nine subspecies of giraffe, the IUCN found that three have populations that are increasing (G. c. angolensis, G. c. giraffa and G. c. peralta), five show declining numbers (G. c. antiquorum, G. c. camelopardalis, G. c. reticulata, G. c. rothschildi and G. c. tippelskirchi) and one has remained stable(G. c. thornicrofti). To reverse the dramatic declines, the IUCN World Conservation Congress adopted a resolution in September for conservation action by various groups, including IUCN member states, United Nations' officials and others. These actions include raising awareness about giraffe declines, restoring the integrity of protected areas for the animals, and supporting already-created giraffe conservation strategies and action plans. Officials also assessed the health of 742 newly recognized bird species, finding that 11 percent of them are threatened with extinction. For instance, a planned dam construction could wipe out half of the habitat of the Antioquia wren (Thryophilus sernai), and as such, the IUCN listed the species as "endangered." Some birds fared even worse, with 13 of the newly recognized species of birds being listed as extinct. These included some lost in the last 50 years: the Pagan reed-warbler (Acrocephalus yamashinae), O'ahu akepa (Loxops wolstenholmei) and Laysan honeycreeper (Himatione fraithii). IUCN Director General Inger Andersen. "This IUCN Red List update shows that the scale of the global extinction crisis may be even greater than we thought," Inger Andersen, the IUCN's director general, said in a statement. "Governments gathered at the UN biodiversity summit in Cancun have the immense responsibility to step up their efforts to protect our planet's biodiversity — not just for its own sake but for human imperatives such as food security and sustainable development.